Subduing the Yard – seek. follow. love. When Chad and I moved into our house a year and a half ago, the front and back yards were completely overgrown. We had walls of evergreen bushes that blocked off whole sections of the yard in the back. We had pachysandra running rampant. We had a jungle of poison ivy, thorny plants and more intentional ground covers taking over the front yard. It’s been quite the process of getting the outside of our house under control– lots of weeding, digging, trimming, cutting, weeding, mowing, weed-whacking, roto-tilling, mulching, weeding, chopping, raking… Did I mention weeding? I imagine we’ve easily filled somewhere between one hundred and two hundred of those brown leaf bags and left them out for the town to collect. We’ve bundled and tied what feels like hundreds of stacks of sticks and limbs. I’m sure whenever the natural waste collectors come by our house, they groan and reluctantly climb out of their truck to pile all these bags and bundles into the back to take away for mulch. I saw them from the window once collecting the heavy leaf bags after a night of rain, and I felt a mix of pity and gratefulness for their job of carrying away all of this stuff that had taken over our yards. We don’t make their jobs easy. But it is rewarding work to get the overgrown bushes out, to clear the front yard and cover it in mulch, to fight the pachysandra back to where it belongs and reclaim areas of our yard. I feel like I’m following God’s plan for Adam, to subdue the earth (Genesis 1:28) and to keep it and till it (Genesis 2:15). I never really liked the word “subdue” in Genesis because I’ve heard it used as an excuse for all manner of anti-eco activities. I care about our environment, and I think it’s our job as humans to protect and care for what God created, not to take it and do whatever we want with it. I don’t think “subdue” is meant to imply that we can destroy, pollute, kill, or otherwise massacre the plants and animals and ecosystems we are a part of, so I never liked that use of the word. But I think I’ve gained a clearer understanding of “subdue” by dealing with our yard. 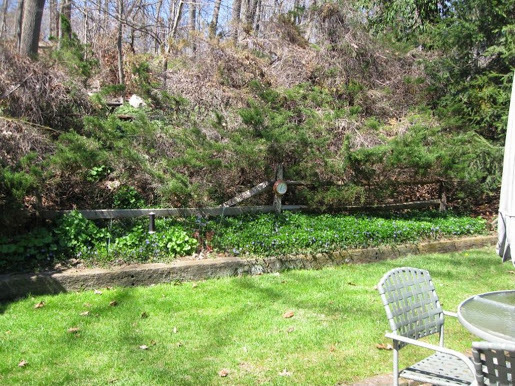 When we finally won control over the poison-ivy-thorn-pachysandra-jungle that was our front yard, and laid down mulch to keep the weeds under control, I felt like we “subdued” it, tamed it, won over the wildness. In high school, I did a long-term service project dealing with invasive plant species in our area. Invasive species– whether plant or animal– are species that are not native to the ecosystem and thus can cause harm to the natural balance. According to the National Wildlife Federation, “Invasive species are one of the leading threats to native wildlife. Approximately 42% of Threatened or Endangered species are at risk primarily due to invasive species.” In terms of the plants I worked with, they grew quickly and out of control, and were aggressive, choking out native species. I spent many hours pulling these species from the ground at the root to help the native plants gain control again. 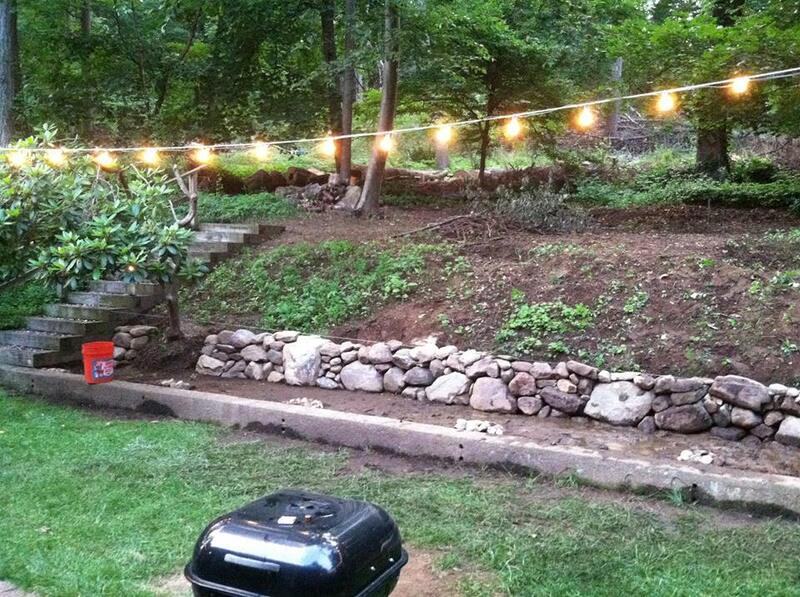 evergreen bushes is gone, and our terraces are started. My point is, we’re tearing out a lot of plants in our yard, and sometimes I struggle with knowing the difference between “subduing” nature by forcing our own aesthetic preferences on it and helping nature thrive– subduing nature in a way that will allow the ecosystem to flourish. I know there are invasive species in our yard and I want to get rid of them because it’s better for all the other plants and animals. I think environmentalism is an important part of my faith. Stewarding the earth is one of the first things God told Adam and Eve to do, and I want to honor that. I am constantly impressed and in awe of what I see in nature. I love traveling because there’s so much to see in our world. I definitely have a soft spot animals. And I hope our work on our yard is reflective of how much we value these things. What do you think? Do you see yardwork align with environmentalism? Is it an important part of who you are?